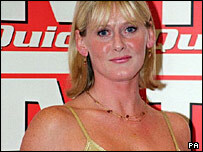 Former Coronation Street star Sarah Lancashire is to play stripper Miss Adelaide in the West End musical Guys and Dolls. Lancashire, 40, will take over the role from former Ally McBeal actress Jane Krakowski, who is currently starring in the show opposite Ewan McGregor. Lancashire, who played barmaid Raquel in Coronation Street, will take the role in December. No details have yet been given for McGregor's replacement. Lancashire will start her role on 5 December. Her previous theatre credits include roles in Blood Brothers, Little Shop of Horrors and Educating Rita. The show's producer, Howard Panter, earlier told the Daily Mail: "Truth to tell, she and her husband saw it and basically she loved it. "What we didn't know was that the notion of playing striptease artiste Miss Adelaide has always been one of her all-time ambitions," he said. Lancashire has recently been seen on TV in The Rotters' Club and the series Rose and Maloney.